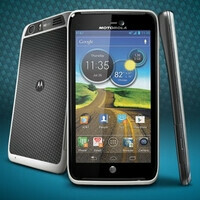 The Motorola ATRIX HD has just been around for a few days, and is already receiving the price slash treatment. Not that it was very expensive to begin with, at $99 with a two-year contract, which gets you a thin device with ICS, 4.5" HD screen and 1080p video recording, but now you can get it for even less. Best Buy seems to be running a promotion for the handset, which pegs the price at $49.99 with a contract, both for the Titanium and the White versions of the handset. Of course, you have to add the $36 activation fee, and at least $60 a month for the talk and data plans, but the handset itself will step you $50, while its SIM-free price is $599.99. One of our readers said they traded in their old ATRIX 4G for $145, and got a $86 Best Buy gift card in the end for the whole transaction - nice, eh. I really hope this aggressive pricing pushes Verizon to get more reasonable. So cheap! $60 a month is steep though. Probably the best deal right now for the specs. I went and tried this phone at the AT&T store yesterday. It's actually really good, just kinda thick for a Motorola phone. Still can't wait for the Droid Razr HD, that should be a total beast. Amazing phone for $50 - after years of offering a very narrow range of android phones, ATT is finally trying to catch up with Verizon. Best Buy is selling the Atrix HD for $50, but is not including the FREE Motorola Vehicle Dock. Anyone know what the value of the Dock is?